Aurora, IL Heating and Furnace Repair - RJ Kuhn, Inc.
Do you need furnace repair or help with other service issues for your home’s heating system in Aurora? RJ Kuhn provides Aurora customers with swift, efficient and timely HVAC solutions. Because we’ve been serving your area since 1972, we’re familiar with Aurora’s many different homes and heating systems. With this Aurora HVAC experience behind you, you keep your unique home or office warm and comfortable throughout the cold season. We work closely with you to ensure you understand what’s functioning correctly with your Aurora heating system and what isn’t. 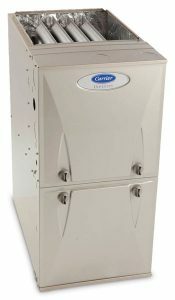 Our initial diagnosis and repair estimate pinpoint whether furnace repair is cost effective or the furnace should be replaced. Our precise assessments often save our customers from hundreds to thousands of dollars. RJ Kuhn heating experts are knowledgeable in all brands of furnaces. Our problem-solving consultation for your Aurora heating and furnace repair includes optimal solutions for dependability, price and energy efficiency. A clean furnace ensures peak efficiency for your Aurora heating. Just a few of the main details we’ll look for is a clean filter that’s keeping blower components and the evaporator coil clean. We’ll also check for dirt and dust that might be slowing the air flow. In addition, we’ll test the amp draws on your furnace’s motors to make sure they’re in range. We’ll test-run your capacitor to confirm it’s within 10% of rating as well. A capacitor failure will stop the blower. Preventive maintenance can save you the inconvenience of a blower failure or costly overtime repair. RJ Kuhn is available for your Aurora furnace repair any time of day or week. We always have technicians on call so we’re there for you when you need us, even during our busiest times. We also carry an array of parts in our trucks to keep us prepared for off-hour service visits. Plus, our flat-rate pricing for residential customers lets you know the set cost of repair work before it begins. RJ Kuhn offers your choice of 80%, 92%, 96% and 97% efficient furnaces. You also have the option of a variable- or multiple-speed blower motor. In addition to consuming less energy, variable-speed motors make your cooling system more efficient because they do not give off heat as PSC motors do. Sometimes it’s easy to overlook the importance of having proper humidity in your home or office. Correct humidity helps you feel healthy and avoid dry skin when it’s cold outside. Since moisture in the air makes our skin feel warmer, you can feel just as comfortable at a lower temperature setting, which will also save you more money. Proper humidity further adds to maintaining the look and condition of hardwood floors. RJ Kuhn heating includes a full range of services. Beyond our furnace repair and replacement for Aurora, we offer scheduled maintenance and inspection; humidifier service and installation; boiler maintenance, repair and replacement; and design, installation and maintenance for radiant heating. Entrust your heating and furnace repair to the specialists who know Aurora’s neighborhoods inside and out. Call us at (630) 554-3336 to speak with an RJ Kuhn expert about your HVAC in Aurora. Inquire about our Kuhn Care maintenance program, which includes 30% off service calls and extended service hours to avoid overtime charges.